So, Kayoko was supposed to come with me today to try Boi to Go (Boi’s take-out only outpost, on 2nd bet. 42 and 43), but she’s suffering from some mad JS-BS-OMG-WTF lately and needed to take a breather, plus she’s been working NON-STOP like Tess McGill from Working Girl (hugs to Kayoko). So, without her company, I stopped by on my way back from mailing a kajillion packages at Grand Central P.O. and ordered the noodles with veggies in sesame-basil sauce (you pick either noodle, rice bowl, banh wrap, salad or baguette, then your choice of meat or veg, and sauce – sesame basil, curry mint, red hot pepper, or lemongrass plum dressing). It kind of reminds me of the Chipotle menu-ordering/ingredient station concept. And all of the meals come with lettuce, fresh tomato, corn (lots) and sliced onions if you want them. Everything was really fresh and tasted great. 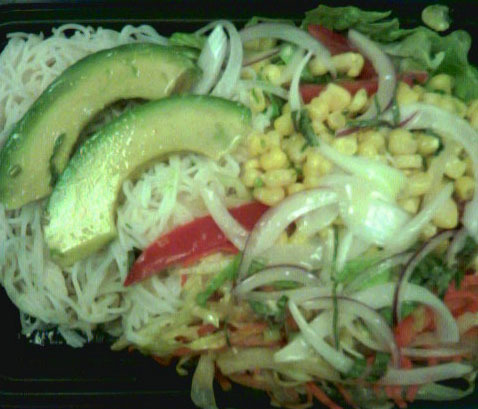 I like that they give you fresh avocado slices (albeit 2) and the sauce was just flavorful enough and didn’t overpower. Aside from the noodles (your typical Vietnamese rice noodle, which they didn’t skimp on) though, it’s not what I would call authentic Vietnamese as an entire dish. Plus, they topped off my dish with a lot of corn….a lot. I plan on bringing Kayoko and Dan next time so we can try out some more stuff. I’ll definitely return, especially since this is like the only Vietnamese place in the area!!! This entry was posted on July 12, 2007 at 5:04 pm and is filed under *Mel, new york, Vietnam(ese). You can follow any responses to this entry through the RSS 2.0 feed. You can leave a response, or trackback from your own site. i miss the JS BS OMG WTF days! brings back such joyous memories! Working Girl is one of my favorite films.